This book offers an advanced breakthrough formula to build, implement, and cultivate an authentic, distinctive, and memorable personal brand, which forms the key to enduring personal success. This new personal branding blueprint entails a systematic and integrated journey towards self-awareness, happiness, and enduring marketing success. If you are branded in this holistic way you will automatically attract success and the people and opportunities that are a perfect fit for you. 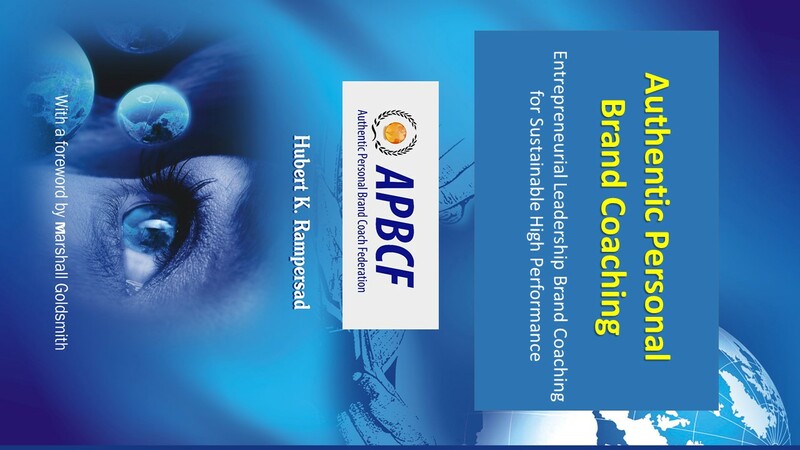 Dr. Hubert Rampersad has introduced an advanced authentic personal branding model and practical related tools, that provide an excellent framework and roadmap for building a strong authentic personal brand, which is in harmony with your dreams, life purpose, values, genius, passion, and with things what you love doing. This unique authentic personal branding system will help you to unlock your potential and build a trusted image of yourself that you want to project in everything you do. It also opens your view to new ideas, possibilities and opportunities. It is combined with powerful tools to deliver peak performance and to create a stable basis for trustworthiness, credibility, and personal charisma. This innovative methodology is spiritual, measurable, holistic, organic, authentic and sustainable. It taps deeply into self-awareness and helps others to develop innovative ways of doing business with social media and to position themselves strongly in this individual age. It has been proven in practice to produce sustainable results, not only for individuals but also for organizations. It’s neither cosmetic nor cloudy, and therefore clients are experiencing concrete and sustainable results within 2 months. …Read further.